You may have noticed that I don’t have many cheesecake recipes on here. In fact, I think I only have one, for a cinnamon roll cheesecake. 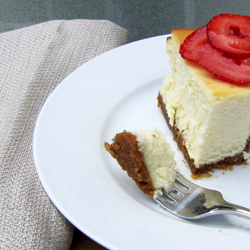 It is not for lack of cheesecake love. It’s actually a long story. 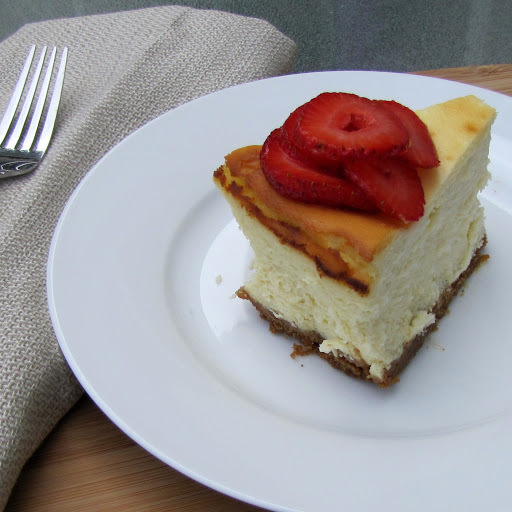 The short version is that I had a cheesecake recipe in a cookbook that I loved and made for years. It was absolutely perfect. It never, ever failed. It was always creamy, never spongy, it had the perfect texture and flavor. It was in a cookbook that I had before I started blogging and putting everything online. A roommate situation gone bad (never move in with a friend you want to keep!) and my recipe is gone forever, never to return. I have tried for years now to find that recipe, sadly, I can’t even remember the name of the cookbook it was in. 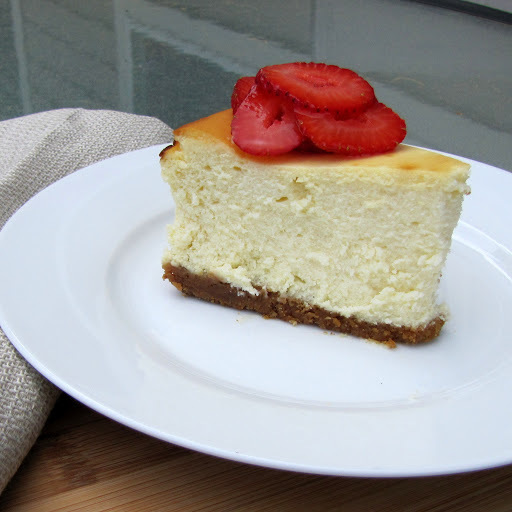 I have tried at least a dozen cheesecake recipes since, and have not found a New York Cheesecake that I felt was worthy of posting on this blog. 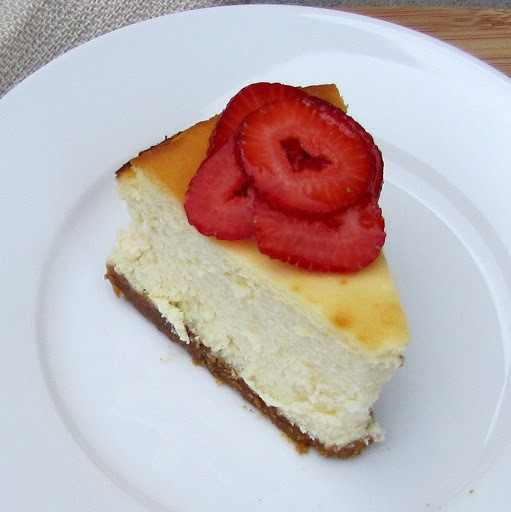 The last thing I want is for any of you to try a recipe I recommend on my blog and end up with a spongy cheesecake. First of all, cheesecakes are expensive, coming in at around $15 to make. Second, there is nothing that makes me as irritated is trying a recipe that somebody has raved about on their blog only to find that it is total crap. 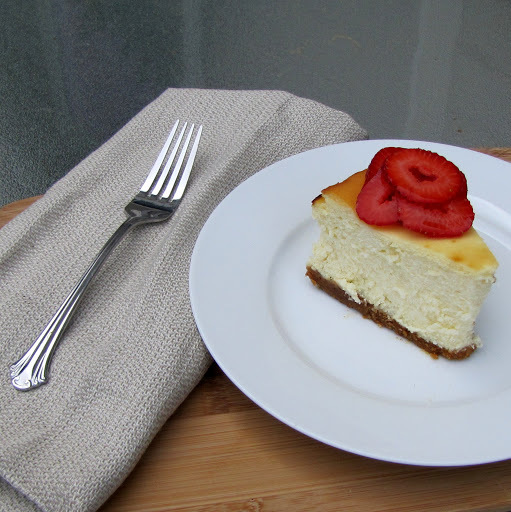 So, finally, I have found a worthy cheesecake recipe for you. I am having a dinner party tonight, so I made this last night to serve this evening with decaf coffee after dinner, and it is divine. Perfectly creamy, perfectly sweet and dense, perfectly rich. Eat it alone, or serve it with fresh, sweetened strawberries, raspberry puree, or caramel or chocolate sauce. Like my original recipe, it has sour cream, and does not cook in a water bath, which is a definite plus. Follow the directions EXACTLY and you are guaranteed to devour. Transfer the crumbs to a 9-inch springform pan and press evenly into the bottom of the pan. Bake about 13 minutes until edges are slightly brown and remove from oven. Increase the oven temperature to 500 degrees F. Beat the cream cheese on medium-low speed for 1 minute. Scrape down the bowl, add ¾ cup of the sugar and the salt and beat on medium-low speed for another 1 minute. Scrape down the sides of the bowl, add the remaining ¾ cup of sugar and beat again on medium-low speed for 1 minute. Scrape down the bowl, add the sour cream, lemon juice and vanilla, and beat on low speed for 1 minute. Scrape down the sides of the bowl, add the egg yolks and beat on medium-low speed for 1 minute. Add the eggs, 2 at a time, beating for about 20 seconds between additions and scraping the bowl between additions. Brush the sides of the inside of the pan with melted butter. Pour the filling into the pan and bake for 10 minutes. Do not open the oven door but reduce the oven temperature to 200 degrees F and continue to bake for 1½ hours. Remove from oven and cool for 5 minutes, then run a knife around the cake to loosen it from the pan. Allow the cake to cool until it is barely warm, 2½ to 3 hours. Wrap in plastic wrap and refrigerate at least 3 hours, overnight is best. Serve with fresh fruit, strawberry sauce, chocolate, or caramel drizzle. 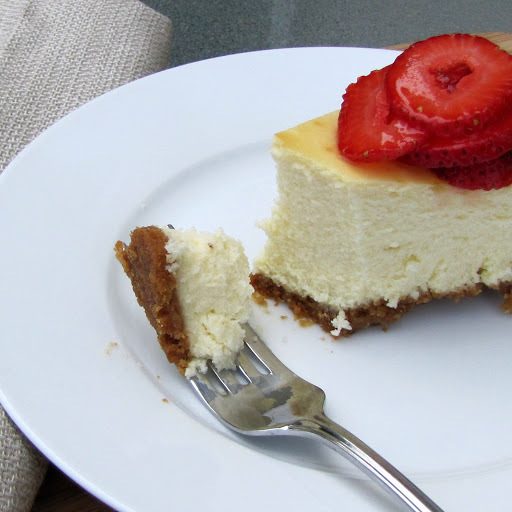 In honor of National Cheesecake Day.